​For many visitors to Walt Disney World, the famously eye-popping nighttime fireworks spectaculars are one of the unmissable highlights of any trip. All of Disney World's theme parks offer nighttime fireworks shows except Disney's Animal Kingdom, which bans pyrotechnics out of consideration for the many animals calling the zoo-like park home. Naturally, you'll want to do a bit of planning to make sure you can maximize your viewing experience and get the most out of each event. We've got tips to help find the best viewing spots for each event. Here's your guide to every fireworks show at the Happiest Place on Earth. Disney bills this fireworks show as the most spectacular in the entire history of the Magic Kingdom, and it's hard to argue. The stunning 18-minute "Happily Ever After" extravaganza features more lasers, lights, and projections than any Magic Kingdom show before it. 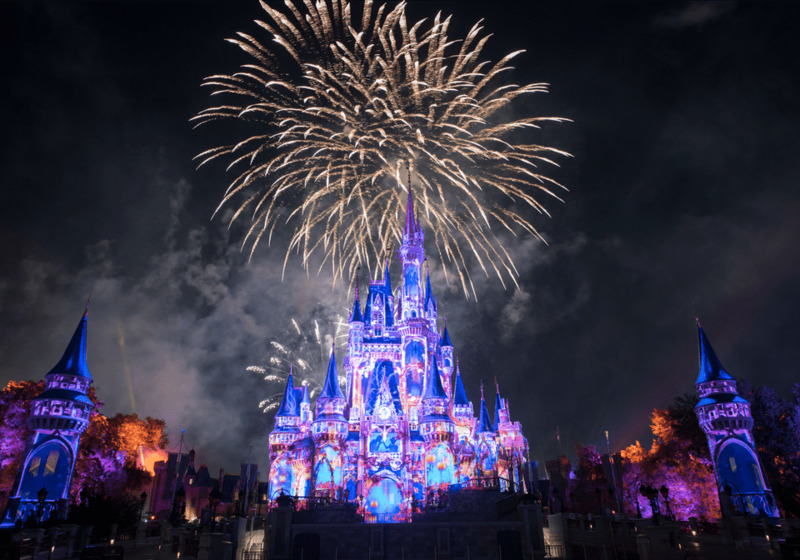 Characters and scenes from more than 25 Disney films appear on Cinderella's Castle through state-of-the-art projection, and more than 50 choreographed spotlights, lasers and, of course, plenty of jaw-dropping fireworks. Best viewing: Because of the projections, you will want to be closer to the castle than was necessary for previous Magic Kingdom fireworks shows. Pick a spot just outside the main hub, as centrally positioned as possible. Best viewing: To get the best view of the projections and pyrotechnic effects in addition to the fireworks, arrive at least 45 minutes in advance to find a place in the Animation Courtyard between the stage and the projection towers. Synchronized to a symphonic score, the 12-minute "IllumiNations: Reflections of Earth" fireworks show enjoys a sensational backdrop as they burst above Epcot’s World Showcase Lagoon. Lasers, dancing flames, cascading fountains, and eye-popping fireworks are choreographed to a dramatic musical score, lighting the skies and reflecting off the lagoon's water. Best viewing: Optimal viewing is the front of World Showcase between the two gift shops, but you need to get there at least 45 minutes in advance. The next-best options are the upper-level terrace at Tokyo Dining (Japanese Pavilion) and the Italy Isola, a small island on the lagoon side of the Italy Pavilion. While not a fireworks show in the strictest sense, the 30-minute "Fantasmic!" extravaganza features pyrotechnics and other special effects. This indoor musical show takes you into the imagination of Mickey Mouse as the Sorcerer's Apprentice as he invokes the characters of favorite Disney classics, including Beauty and the Beast, Cinderella, Aladdin, The Lion King and more. Best viewing: You can use FastPass+ to guarantee seating for this show. During the 12-minute "Happy HalloWishes" fireworks extravaganza, orange fireworks explode over Cinderella's Castle while illuminated pumpkins are projected with lights. The show is part of Mickey’s Not-So-Scary Halloween Party, an after-hours Halloween celebration that requires a separate ticket and takes place during the spooky season. A highlight of the holiday season is the 10-minute fireworks extravaganza, “Holiday Wishes: Celebrate the Spirit of the Season.” This show takes place during Mickey’s Very Merry Christmas Party, an after-hours party and special-ticket event that takes place on select nights in November and December at Magic Kingdom park.